8 cups chopped lettuce- I used butter lettuce here but any lettuce combo will work. 1. Chop the pressed tofu into cubes. Place in a bowl and cover with ½ cup BBQ sauce. Toss to evenly coat. Marinade for at least 20 minutes. 2. Make the dressing: whisk together the mayo, soymilk, chopped parsley, garlic powder, 3 tbsp. BBQ sauce and pinch salt/pepper. 3. Preheat the oven to 400 degrees F. Remove the tofu cubes and place on a lightly greased baking sheet. Bake for 15 minutes. Remove, flip cubs and lightly brush with remaining BBQ sauce- you might not use it all. Place back in oven and cook for another 10-15 minutes. 4. Assemble the salads: Either place all ingredients in a large bowl and toss together. Or, to serve individual salads (like photographed) place 2 cups lettuce, ½ avocado, ½ cup shredded carrots, ⅓ cup black beans, ¼ cup corn and 1 chopped tomato on each plate. 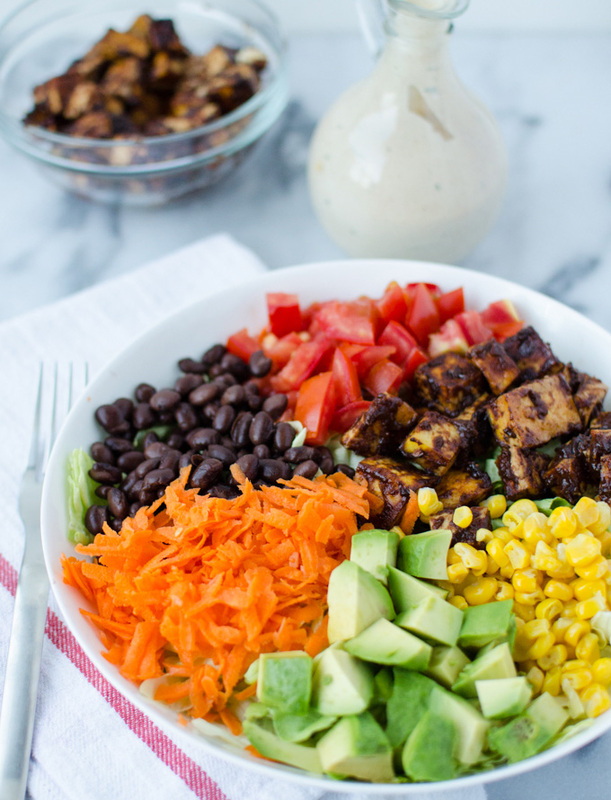 Serve with ¼ of the tofu and drizzle with BBQ-ranch dressing.